Fonthill by John Rutter, 1832.
and the thunder came, peal on peal, with scarcely a second between them. Louis Dubroca’s Vida de J. J. Dessalines, gefe de los negros de Santo Domingo, Mexique, 1806. Bon Dje ki fè la tè. Ki fè soley ki klere nou enro. Bon Dje ki soulve lanmè. yo ki swaf dlo lan zye. Koute vwa la libète kap chante lan kè nou. owner should have grown too large to inhabit it. Sexual Stealing is a work of poetic nonfiction that has grown from my discovery that English Gothic fiction is intimately linked with the form of chattel slavery practiced in the eighteenth century on the sugar plantations of Jamaica and Saint-Domingue (now Haiti). Of the four major names in early Gothic literature—Anne Radcliffe, Horace Walpole, Matthew Lewis, and William Beckford—all had some immediate connection to the slave trade, Radcliffe through her links to Abolitionism (the Wedgwood circle), Walpole through the policies set in place by his father, Sir Robert Walpole, and Lewis and Beckford as actual owners of sugar plantations in Jamaica. At least three of these showed strong queer tendencies at a time when homosexuality was punishable by death. Beckford, for instance, was thus in the position simultaneously to enact the ultimate theft of which humans are capable—of life, of liberty, of desire—and to suffer the same himself. In reading the works of these authors, the ancestors of “horror” in modern literature and film, I found them imbued with the violent vocabulary of slavery. This inspired my compositional method, modeled on the mesostics used by John Cage to derive the libretto for his “Roaratorio” from Finnegans Wake. Using the text of Radcliffe’s The Mysteries of Udolpho, I selected one word from each line. Keeping these in the order in which I found them, I found that stanzas emerged, which seemed to suggest the voices of a number of characters dealing with the experience of slavery and strategies of resistance. I juxtaposed these voices to relevant images and text, mostly from artists and authors of the time on slavery and other matters, working to create a polyphonic text in the manner of some of Paul Metcalf’s. This excerpt is from the beginning of Part Two of the book. 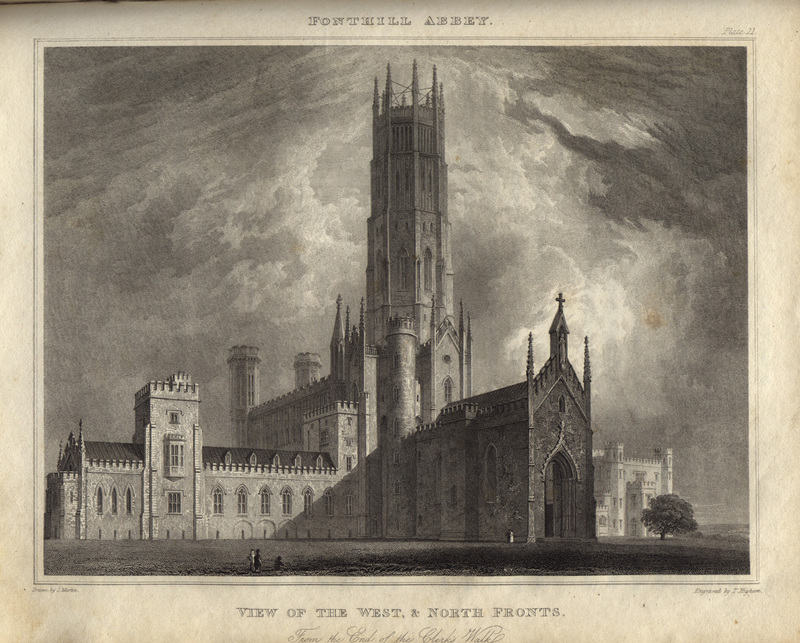 In 1799 Beckford returned from his long exile on the Continent and started to build the folly of the age, Fonthill Abbey, an architectural amalgam of Portuguese Gothic and English monastic church, serving as shrine, showplace, home, refuge, and tomb. Its enormous central tower fell down three times in thirty years. It housed the countless treasures of Beckford’s collecting mania. He built it, and its surrounding six-mile-long wall, largely in response to society’s rejection, and in consequence it became the desire of “everyone who was anyone” to visit it. But the only two people Beckford ever invited there were Lord Nelson and Emma Hamilton. Lady Maria Nugent (1771–1834) was born Maria Skinner to a prominent New Jersey family who were Loyalists during the War for Independence. After the war, they moved to Britain where Maria met and married Field Marshal Sir George Nugent, later Governor of Jamaica. During her husband’s governorship, from 1801 to 1805, Maria Nugent kept a diary that provides a rich picture of an aristocratic lady’s adjustment to the island’s life during a politically critical period. Though she felt sympathy for the slaves, and even expressed guarded admiration for Toussaint L’Ouverture, she was not an abolitionist. Her political conservatism notwithstanding, she was appalled by the majority of plantation owners and sugar itself became for her the stuff of nightmare. Boukman Dutty was the first leader of the Saint-Domingue Revolution. He was headman on one of the larger plantations of the northern plain, and a coachman, which facilitated his contacts with slaves throughout the region. It seems that he got his name, Bookman in English, from the fact that he carried a book, probably a Koran, with him to Jamaica, his first place of servitude. He was literate, and being of the professional slave class, was able to follow political developments to some extent, through written sources, oral communication, and overheard conversations. He was large, strong, and charismatic. He became a voodoo priest and developed a huge network of contacts throughout the island. It is quite possible that he saw himself as a warrior marabout. On the night of August 22, 1791, thousands of slaves gathered on a mountain in the forest above Le Cap. It was the beginning of the uprising. Boukman delivered instructions and led a voodoo ceremony. He exhorted the slaves with the quoted speech, which was remembered and repeated. Then, that same night, he and other leaders led their bands to attack the plantations, kill their owners, raise the slaves, and set fire to the crops and buildings. 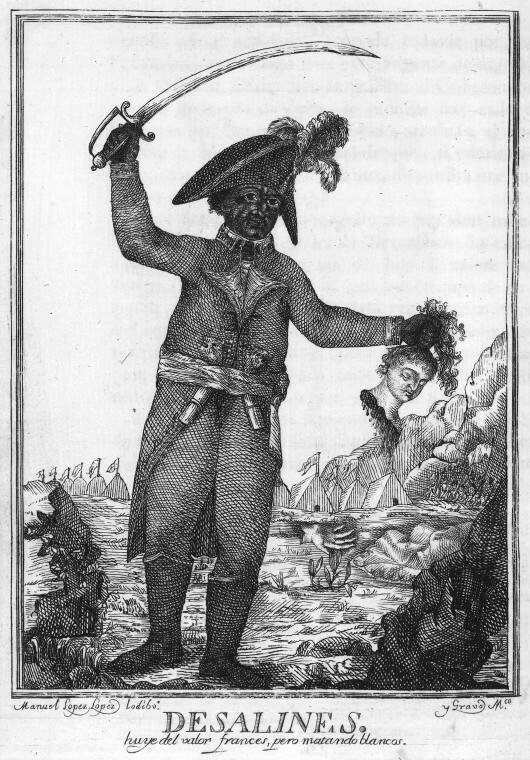 This image, possibly by the artist Miguel López López, appears in a biography of Toussaint’s general and successor Dessalines published in Mexico. The author, a teacher of oratory rhetoric named Louis Dubroca (1757–1835) was commissioned by the Bonapartist government to write propaganda vilifying the Haitian Revolution in the hope that such accounts would incite counterrevolutionary action in the Caribbean. Wendy Walker’s books include The Secret Service; The Sea-Rabbit, or, The Artist of Life; Stories Out of Omarie; Blue Fire; and My Man and Other Critical Fictions. She is the editor of Proteotypes.